It's been a few years since we had a vacation in Palm Springs. We stayed in a huge house in the PGA estates because my husbands uncles worked with a great boss who allowed us to vacation in his home. The families all packed up, filled up the kitchen with food while all the aunties cooked delicious meals as we all enjoyed time in the pool and jacuzzi in the back yard. Although it was extremely hot in the summer months, it was a fun memory to look back on. We currently had rewards points to redeem and I needed to use them before they expire. Since we are traveling to the Philippines this year, I have to keep any vacations mini and close to home. I can't really take time off of work since a lot of it is used for our big trip. I thought Palm Springs would be perfect and when pulling up the price, it came to a total of $12. Yes. A resort surrounded by a beautiful golf course, lakes and of course, palm trees. So happy that I booked it! My mother-in-law seen my post on FB and told me that she's able to get us a room for free at a resort she goes to. Being that our son is home for the summer, she booked it for a nice long Memorial Day weekend which also was part of my birthday weekend. 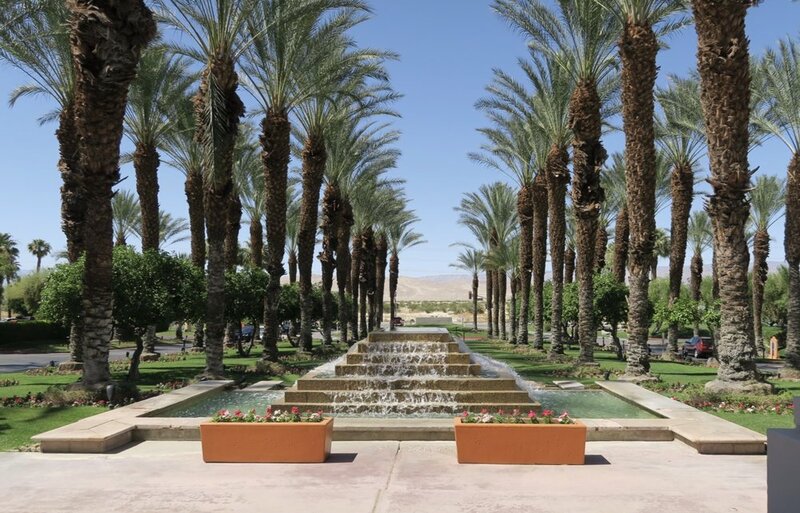 We stayed at Agua Caliente Resort & Casino in Rancho Mirage. We had a beautiful room with a balcony, 2 queen beds and a nice full bathroom with a separate shower, bathtub, toliet room and a cool TV to keep you entertained as you get ready. We had to try a great well-known place for breakfast which is called Elmer's Restaurant. Perfect pancakes that just melt in your mouth without the doughy taste. The Crabacado omlet was delicious as well as the clam chowder. My son had the patty melt which was good, but nothing out of the ordinary. We also tried Shabu Shabu Zen. Our first shabu shabu experience and a very delightful one too! It's best to rsvp if you dine there. The quality in their ingredients are absolutely fantastic. The authenticity of the dishes along with their customer service was stellar for us. The owner was very personal with us and we felt very welcome. We also got a personal closing when we left as they walked us out, kindly opened the door and bowed. There are also strips to walk. It was too hot for us, so we made it a pool day. The following weekend was just my husband and I where we stayed at the Doubletree Golf Resort and Spa in Cathedral City. Just an amazing place overall. The ambiance was so inviting. Unfortunately, our room wasn't ready upon check-in which was only about 30-45minutes in standby. They did compensate us with drinks at the bar and some homemade cookies as we wait. In that time, the pool view was refreshing to look at. A hammock in the corner, ice cold fresh water and cups for guests, canopies, and games on the grass to play. Along side of that, the golf course view just hugged the hotel with an immaculate setting. Even though the hotel is as old as it may be, we really enjoyed the stay. We had a balcony as well with our stay. To make things even more extravagant, our stay was during restaurant week. This means many restaurants offer a pre-fixed menu for the week with an amazing set price that is usually for lunch and dinner. You can never go wrong with saving money. Praise the wallet Gods! We dined for dinner at Wally's Desert Turtle in Rancho Mirage. Live music, fancy schmancy dinner and a stunning setting. Our dinner was a 3-course meal so we each got a starter, main entree, and dessert. As fancy as it was, the owner was also very personal and friendly. He chatted with us a bit and as we left as well. Palm Springs also has an outlet shopping center called Cabazon Outlet and Desert Hills. I was confused because it was originally called Cabazon Outlet but since they expanded it, either they changed their name or it's two malls in one. All in all, Palm Springs is just a wonderful place to visit. For us, short but sweet and full of fun. We hope you get to venture out there one day and share with us your wonderful moments!